Commercial acting is harder than it looks! You never get the copy in advance so it’s almost always a COLD READ AUDITION! 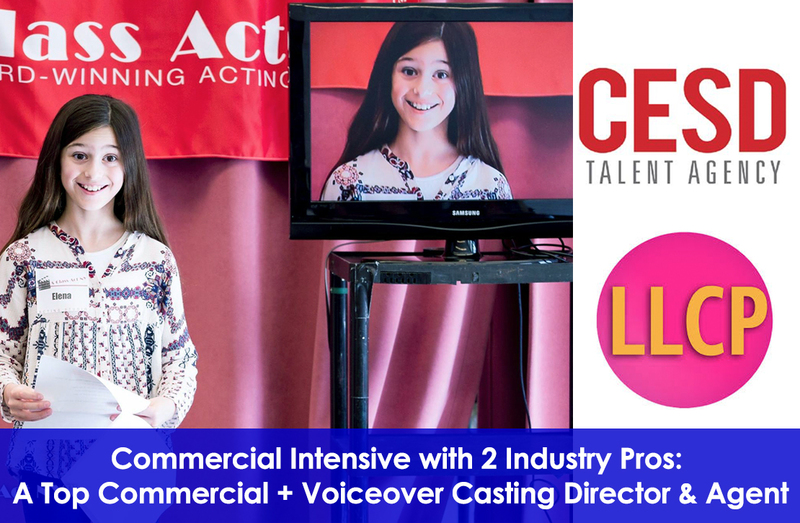 In the first half of the class, kids and teens will learn how to nail cold read auditions with a top NYC Commercial + VO Casting Director, Rachel Reiss of Liz Lewis Casting Partners. You’re in great hands with Rachel who will show you the ropes of commercial acting and audition technique! Rachel will teach budding thespians how to quickly analyze commercial copy and find the acting beats within the text to make a lasting impression on both the casting director and on ad agency executives! After learning proper commercial acting technique, casting director Rachel Reiss will conduct mock auditions in which she will offer helpful feedback and coaching! In the latter part of class, take what you’ve learned with Rachel and perform for top NYC Agent Stephanie Corvino of CESD who will also conduct mock auditions and offer feedback and coaching! Where: Ripley-Grier Studios – 520 8th Ave.
*Please note this is purely an educational experience and not an audition. Participants are not guaranteed employment or representation.